November 18, 1999 the Texas Aggie bonfire fell to the ground in the early morning hours before its construction was complete. News of the tragedy was painful for everyone who loves A&M. 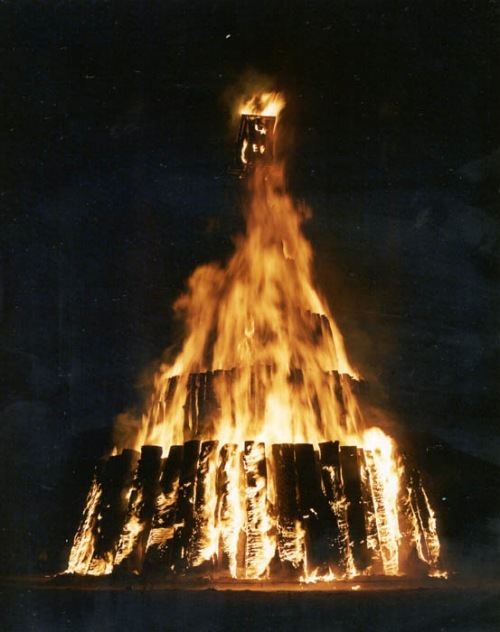 Aggie bonfire was an annual tradition that followed set protocols before Thanksgiving Day football game against the University of Texas. Students built it. And students burned it down as an expression of, the tradition goes, the burning desire to beat tu on the football field. It was for the most part good, albeit elaborate, fun. When the stack fell, a sobriety rose in its wake. Twelve lives were lost in that accident. Thousands of lives were impacted deeply. Following is an article I wrote for our local newspaper in Florida in the wake of the tragedy fifteen years ago. For two days last week the nation’s attention was riveted on the central Texas campus of Texas A&M University where 12 students were killed and dozens more injured during the construction of a bonfire. While everyone recognizes the tragedy in the loss of young lives, for those who are associated with the university, the mourning and sense of loss goes much deeper. Those 12 young people were not just students, to us they were Aggies. It is hard to explain Aggie spirit to those who are unfamiliar with A&M. Founded during our nation’s centennial as Texas Agricultural and Mechanical College, A&M is now one of the major research institutions in the nation. A&M does not have an ex-Aggie alumni organization because they really do believe that once an Aggie, always an Aggie. So alumni refer to themselves as “former students.” We still feel ourselves to be very much a part of the universtity family. So the death and injuries of those students touch us deeply, even though we did not know them personally. The Vice President of the student body at the University of Texas, A&M’s arch-rival, sensed something of the Aggie spirit during the memorial service which was held on A&M’s campus the night after the bonfire collapsed. He was part of a delegation from UT which attended. Singing about God’s grace only hours after the deaths of their classmates is in itself an act of grace. There is no way to make sense out of untimely deaths. This is a time for faith, not superficial answers. At the end of the day, after all the analysis has been done and our thoughts have left us unsatisfied, we must look up. We must look to the one who created us, whose grace sustains us even through our darkest nights. Jesus did not allow his friends to misunderstand a similar tragedy which occurred in his day. Eighteen lives were lost when a tower collapsed in the city of Jerusalem. Some were tempted to think that those who suffered merely got their just due. But Jesus spoke plainly: “Do you think that those on whom the tower fell were worse sinners than all other men who dwelt in Jerusalem? I tell you, no; but unless you repent you will all likewise perish” (Luke 13:4-5). Tragedies humble us. They force us to admit our weakness. Rather than concluding that those who suffer terrible accidents somehow must have deserved it, we should reason like Jesus. The right response is to realize that those people were no different than we are. We have not been spared because we are better than they were. It is only by God’s grace that we are still standing. Acknowledging the grace of God in your life sets you free to serve others in their time of need. That is exactly what is happening on and around the A&M campus. Within a few hours of the early morning collapse of the bonfire, thousands of students circled the rescue site in prayer. Local businesses sent employees to distribute not only food and water to workers and family members but also cell phones to students so they could call their parents to let them know that they were OK. Volunteers from across the state offered their equipment and expertise to help remove the fallen logs. Student organizations and local churches started prayer groups throughout the twin city area. No one knows what the future of the bonfire will be. That decision will be made by university officials after studying a special task force’s investigative report into the incident. Whether or not the fire is lit in the year 2000 and beyond, the events of the last week indicate that the spirit of Aggieland will continue to burn bright. The game that following the tragedy was an emotional moment for both universities. And though fierce rivals on and off the field, that day, the University of Texas displayed unsurpassed class and sensitivity, as the video below shows.